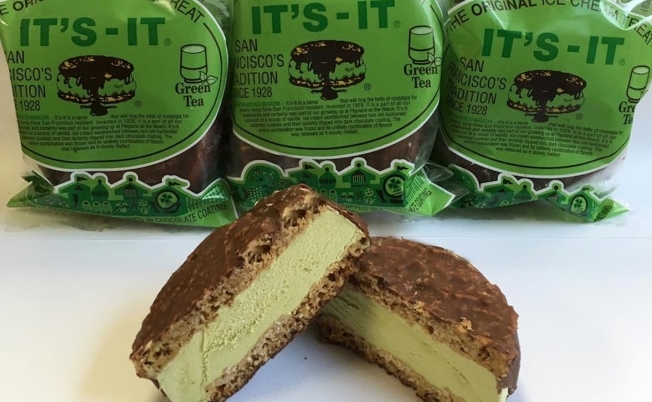 It's-It's new green tea ice cream sandwich. The Bay Area's 88-year-old ice cream sandwich company is making a foray into Japanese flavors. It's-It announced on Thursday that the newest flavor of ice cream sandwich is green tea. The company began in 1928 as a vendor selling chocolate dipped oatmeal cookie ice cream sandwiches at Playland-at-the-Beach, an amusement park at San Francisco's Ocean Beach that was shuttered in the 1970s. Now, there's a factory store in Burlingame that sells the full It's-It product line, including frozen cookie dough that can only be purchased there. Green tea is the first new flavor for It's-It since the company introduced pumpkin in 2014, a release that caused temporary shortages throughout the Bay Area.